We’d love your help. Let us know what’s wrong with this preview of Tempered by Krista Wayment. 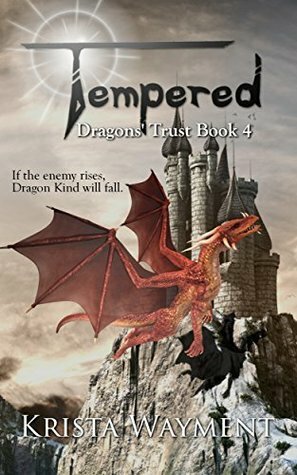 Renick, Thane, and Lainey must face down the original enemy of the Dragon Kind. The centuries-old man who slaughtered dragons and stole their heart stones to feed his own greed for power. Individually they lack the strength to vanquish the greatest foe they have ever faced. Together and with the added strength of old and new allies, they might just succeed. But when Renick Renick, Thane, and Lainey must face down the original enemy of the Dragon Kind. The centuries-old man who slaughtered dragons and stole their heart stones to feed his own greed for power. To ask other readers questions about Tempered, please sign up. I thoroughly enjoyed reading this with my 13 year old son who loves fantasy. Thank you for such engaging characters. Dragon and humans akin unite to join forces to combat those of evil and alike for the survival of the Dragon race. Krista Wayment has been making up stories since she learned to talk. Writing naturally grew out of that. Krista is an avid Fantasy and Science Fiction fan, and a total nerd. She is also a software engineer and loves playing video games. Although, curling up with a good book is still one of her favorite past times.